The new component will be called tc-books. You can continue working on the code we wrote in the previous article. If you had trouble completing it, please checkout the polymer-book-form-2 branch of the books-service repository. It contains all the code from the previous article. If you have trouble following the exercises in this article, the complete source code can be found in the polymer-books branch of the books-service repository. We’ll continue working using Test-Driven Development approach. The setup with Docker container that we used before is still valid. If at any moment during the exercises provided below you feel the need to see the result, please open http://localhost:8080/components/tc-books/demo/index.html in your favorite browser. Let us start with high-level requirements. 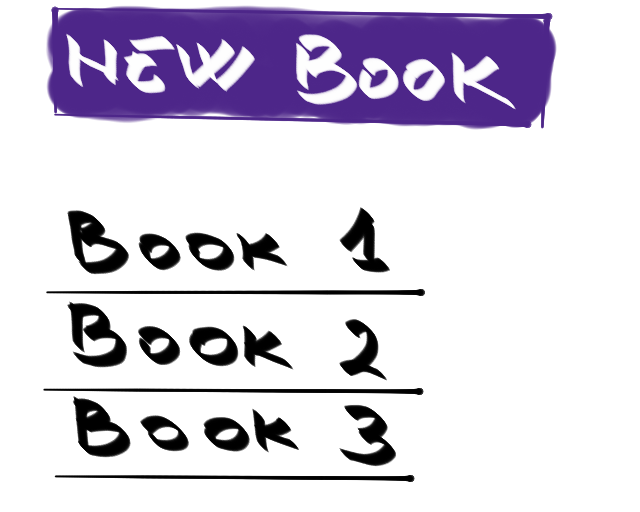 The idea behind this second component is to have a way to list books. 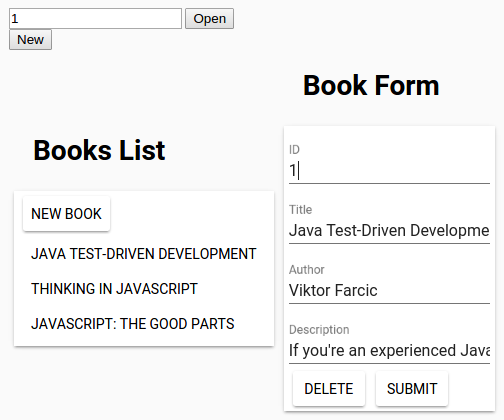 Each of the listed books should be a button (or a link) that will send custom event with information about the selected book. There should also be a New Book button that should send another custom event. As before, this component will be part of the same microservice as the previous one. We’ll start by adding the new component to the Demo page. Please open the components/tc-books/demo/index.html and add the following code. We should also import the component. From now on, everything we do inside this new component will be visible in the demo page. We’ll start with familiar elements like iron-ajax and paper-toast before diving into new stuff. We should have a way to query the back-end server for the list of books. The back-end server expects the GET request to be made on the /api/v1/books URL. As with the previous component, we’ll start by defining properties that we’ll bind to the iron-ajax element. With the property defined, we can move to the iron-ajax element. Unlike previous utilization of this element, this time we can set it to automatically perform the HTTP request. Later on there will be few other differences in the way we’re using this element. That way you can experience various ways to accomplish the same result. Next, we should handle possible error responses. We’ll use the same logic as before and implement paper-toast, bind its text to a property and call the show function. Finally, we should add on-error to the ajax element. While we’re at it, we’ll also add last-response as well. When iron-ajax receives a response from the server, it will put it into the variable that can be accessed later on. Now that we are making a request to the back-end server and storing the (last) response to the ajaxResponse variable, we can work on displaying the listing. We can use the Template Repeater to display the list of books and it binds to an array. The code could be following. In our case, the template array is ajaxResponse set by the ajax element. Everything inside the template is repeated for each array element. We put paper-button that, when clicked, will call the (not yet implemented) function _openBook. Let us specify the _openBook function. Since the action of opening a book is in the other component and we cannot communicate with it directly, we are left with only one option. We can fire an event. Even without this limitation, this is a good way to accomplish loose coupling. We are building Web Components and leaving to others to decide which ones to use and how. With the listing up and running, we might want to also add the New Book button. As with the Open Book action, this one also belongs to the other component. The approach is similar to the one we did earlier. We’ll add the paper-button element, bind its text to a property and send a custom event whenever it is clicked. We are almost done with functional part of the component. The only thing left is refresh function. Data can be changed through the tc-book-form component we developed earlier. We should have the option to refresh data in the tc-book component whenever the first one successfully requests the back-end to do some update. The final result with both components inside the demo page should look like this. We developed two separate components (tc-book-form and tc-books). Functionally, they are completely separated one from another. From deployment and architecture perspective, together with back-end, they are the part of the same microservice. We are still missing a bit of polishing. In the next article we’ll apply few styles and create a way for users of our components to have partial control of the look and feel. We’ll improve our Demo page and create proper communication between our components. Even those tasks do not conclude our work. We still have pending work on importing the components into a separate Web Application, take care of proxy with nginx and do the deployment of our Docker containers. The story continues in the Styling and Communication article.